It really is no surprise that Acer has great influence in India’s laptop market. It’s true that the industry is crowded and there is competition everywhere. India’s economic boom has made it an attractive market for computer companies. But for many reasons, Acer has the inside track when it comes to market share and developing loyal customers. These laptops are always reasonably priced. Even though these computers are very powerful, they are well within reach of customers’ pockets. Their product line-up offers something for everyone, from entry-level to power users. Their popular lines like Extensa, Olympic, TravelMate, Tineline and Aspire provide quality performance. Each model is designed to perform tasks like web browsing and drawing easy. Watching movies, playing games and listening to music become effortless. These laptops also make it easy to use office applications like word processors, spreadsheets and presentations. The latest models are bundled with Windows 8. This is a bonus for many users. They don’t have to worry about installing the operating system on their own. Many of them also have some software pre-installed. The company is known for their reliable products. In India, customers place a great deal of emphasis on reliability. Unlike other laptops, you can expect to use these machines for many years. There’s no need to upgrade every six months. The technology provided means the computer will still be useful years down the road. This is another reason why Acer laptops have a great influence in India. New models are being released with innovative features. These are not just eye candy or fluff; they make tasks easier for the end users. The Acer Aspire 9800 series has a whopping 20 inch widescreen. It is ideal for those involved in graphic and desktop publishing. The big screen is also great for playing games and watching films. As anyone who’s ever done business in India knows, films are big there. It even comes with a video camera. If you don’t need that big a screen, there’s the Acer aspire 9500’s 17 inch crystalbrite widescreen. The 7100 Acer laptop also has a 17” display. These giant screens are very popular on India; Acer is simply giving in to the demands of the market. 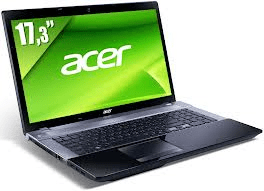 The Acer 9100 comes with a TV tuner; the 5100 series has 1 GB of RAM and is a 64 bit machine. The 5000 Series on the other hand, is known for its long battery life and speed. For road warriors, the 3610 series is very popular because of their portability. In short, the company offers something for everyone. Acer clearly knows what computer users in India need. They have developed a wide range of products catering to different audiences. There are laptops for the businessman who is always on the go models for the home user, the gamer and the budget users. These computers and laptops are available all over India. You can find them in stores, shops and of course the Internet. Wherever you decide to buy, make sure that you do some research first; try to find the best model to suit your needs.